SEATTLE (AP) It’s not often Richard Sherman and Earl Thomas spew compliments of an opponent, especially a rookie. Watching the Seattle Seahawks defense get torn apart by rookie quarterback Deshaun Watson and the Houston Texans on Sunday had Sherman, Thomas and their teammates issuing praise rarely heard from one of the top defenses in the league. Defense was optional as Watson and Seattle’s Russell Wilson put together two of the best regular-season quarterback performances in league history in Seattle’s wild 41-38 win over the Texans on Sunday. The Seahawks entered the week with the best scoring defense in the league, and proceeded to allow 21 points in the first 21 minutes of the game. The 38 points was tied for the second most allowed by the Seahawks in a regular-season game since coach Pete Carroll’s first season in 2010. Shootouts have not been part of Seattle’s winning formula, yet Sunday showed they have the capability entirely because of Wilson. Wilson was responsible for 472 total yards passing and running. Houston’s defense had shown vulnerability, especially with the loss of J.J. Watt and Whitney Mercilus for the season due to injuries. But Wilson’s performance was special, capping it by going 80 yards in barely a minute and no timeouts, and hitting Jimmy Graham on an 18-yard strike with 21 seconds left to take the lead. Sherman and others on Seattle’s defense said Wilson’s performance bailed out the Seahawks. Wilson disagreed. ”It’s not about bailing anybody out. It’s about finding a way to win,” he said. Even more impressive is what Watson did to Seattle’s defense. The Seahawks pride themselves on not allowing big plays, yet surrendered 509 total yards to Houston. 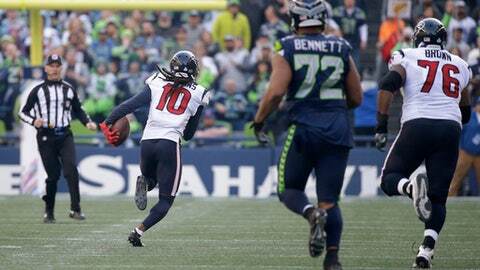 The Texans had 10 plays of 20 yards or more against the Seahawks, including touchdown passes of 72, 59 and 20 yards. Watson was responsible for 469 yards passing and running. Watson’s first five starts were fantastic. His performance against Seattle – and willingness to attack secondary stars like Sherman and Thomas – was validation that going forward he can star against any defense in any environment. NO RUNNING: Seattle’s got to get its run game fixed. Wilson was the Seahawks leading rusher with 30 yards. The rest of Seattle’s rushers combined 3 yards on 17 carries. It was a pathetic performance in the run game that would be a bigger issue if not for Wilson’s late heroics. In four of seven games this season, Seattle has failed to reach 100 yards rushing as a team. ALL TDs: Perhaps teams need to stop focusing the majority of their attention on DeAndre Hopkins. Will Fuller has 13 total receptions for the season and seven of those have gone for touchdowns. He had two long TDs against Seattle, including a 59-yarder on Houston’s opening drive, and another long catch down to the 2-yard line. Fuller missed the first three games due to a collarbone injury, but has been nearly unstoppable from finding the end zone since returning. ”When guys want to cheat to my side, you have to watch Will and Bruce (Ellington) as well. But Will has been playing his (tail) off,” Hopkins said. PROTESTING: All but 10 members of the Texans took a knee during the national anthem, as the vast majority of the team protested the owner’s ”inmates running the prison” comment. Left tackle Duane Brown said a meeting with owner Bob McNair went ”not too well,” but the Texans were able to put aside any distraction from the issue. Brown served as spokesman for the majority of the Texans players and didn’t speculate how the issue would be handled going forward. ”At this point we’re all just trying to play for each other. It will have to come up again at some point,” Brown said.